Being the fact it's Friday, I'm home sick, it's related to my interests and that this picture moved me - I thought I'd share it. I'm a regular reader of Phil Plait's Bad Astronomy blog, and recently he posted this image from NASA's Juno spacecraft heading to Jupiter. 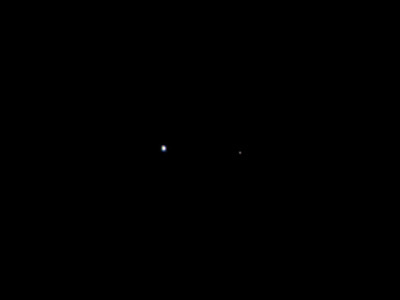 It's a picture of Earth and our moon from almost 10 million kilometers away. Now just for a moment, contemplate the sheer scale of what's being mentioned there - a tenth of the distance from Earth to the Sun, and this is all we see. It also helps highlight just how far away the moon really is, and it's not even at an angle which reflects the true distance spanning the two. As in Phil's blog, this reminded me of part of what I think is my favourite literary piece ever, from Carl Sagan's Pale Blue Dot. "The earth is a very small stage in a vast cosmic arena. Think of the rivers of blood spilled by all those generals and emperors, so that in glory and triumph they can become the momentary masters of a fraction of a dot. Our planet is a lonely speck in the great enveloping cosmic dark. There is perhaps no better demonstration of the folly of human conceits than this distant image of our tiny world. To me, it underscores our responsibility to deal more kindly with one another, and to preserve and cherish the pale blue dot. The only home we've ever known"
He is of course referring to a different image, taken from 6 billion kilometers away - but it works just the same.